I’ve been a resident of Hoole for some years now, and love our incredible High Street – Faulkner & Charles Street. I love to shop locally and use independent traders as much as possible. We have butchers, bakers, fishmongers restaurants and bars in Hoole. I recommend popping down if you ever visit Chester. In 2016 Hoole was awarded best Local Centre/Parade of Shops by The Great British High Street Awards. A campaign I was lucky enough to design for, creating the brand identity and posters for Hoole Life. One of my favourite shops in the area is Chester Beer and Wine. They approached me to design an A5 leaflet to advertise a new venture of theirs. They will soon be offering luxurious holidays to the Champagne region in Northern France. It’s a money can’t buy, once in a lifetime holiday allowing you to get behind the scenes at some of the areas top Champagne Houses. Sam and Sue at Chester Beer and Wine were after a classy understated design but also one that highlighted the luxurious nature of the holiday. We played with the idea of using a metallic fifth colour for the gold and also looked at various different print finishes. Eventually, we settled on the classic gold and black theme and the text created out of four colour. Once the artwork was approved it was printed on a slightly thicker stock than usual, a 250gsm silk finish – printed at We Do Leaflets. 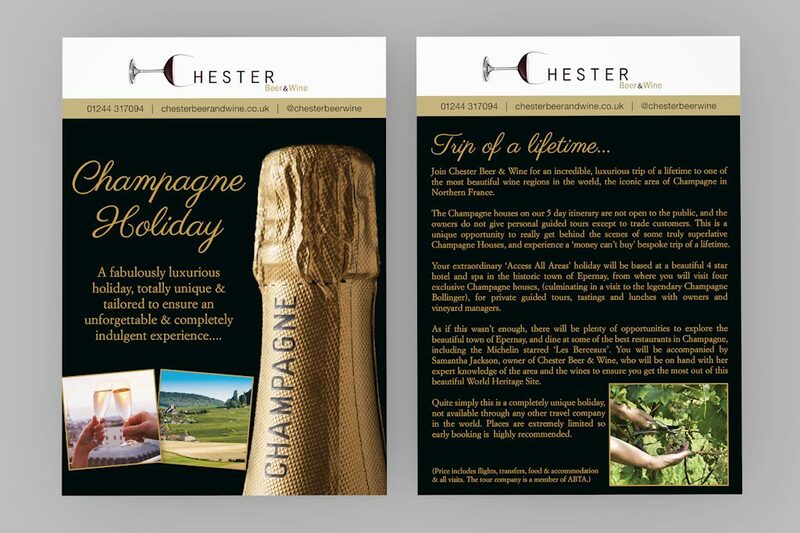 The heavier weight gave the final printed leaflet a feeling of quality. The artwork has also been used on all their social media accounts to advertise the holidays. Look out for the leaflets around Chester. And stop by Chester Beer and Wine in Hoole, you’ll be amazed by their selection, and blown away by their knowledge.